St. Augustine National Cemetery traces its history back to a Spanish monastery founded during the 18th century. Today, the cemetery perhaps is best known as the home of the Dade Pyramids, believed to be the oldest memorial in any national cemetery. The cemetery also features a unique Spanish Colonial-style superintendent’s lodge designed to complement the historic architecture found throughout St. Augustine. Founded in 1565 by Spanish explorers, the city of St. Augustine is the oldest continuously inhabited European city in the United States. The land upon which the national cemetery sits was originally part of a Franciscan monastery that operated until the English took possession of Florida in 1763, converting the monastery into the St. Francis Barracks. The Spanish regained possession of the territory in 1783 and held it until 1821, when Florida became a part of the United States; all the while, the site remained a military installation. A portion of the yard at the St. Francis Barracks was set aside for use as a post cemetery, with the first burials occurring in 1828. Most of the early burials in the cemetery were casualties of the Indian Wars, a series of conflicts waged between 1817 and 1858 as the United States forcibly removed Native Americans, notably the Seminole tribes, to lands west of the Mississippi. Later burials include those of Union soldiers. Although Florida seceded in 1861, Union troops captured St. Augustine in March 1862 when the gunboat Wabash entered the harbor. In 1881, the post cemetery was elevated in status to a national cemetery. St. Augustine National Cemetery covers a 1.3-acre rectangular site at the edge of what was once the walled Spanish city. The northern half of the grounds are enclosed by locally quarried Coquina stone walls, while a wrought-iron fence surrounds the southern half. Four pedestrian gates, two each along the eastern and western walls, allow access to the cemetery. Walkways connect each gate to its counterpart along the opposite wall, and a central avenue serves as the physical and symbolic link between the flagpole at the north end of the grounds and the Dade Pyramids at the south end. Also at the north end of the cemetery is the superintendent’s lodge. Built in 1938 out of Coquina stone, the lodge is in the Spanish Colonial style, like much of St. Augustine. The nearby rostrum is also composed of Coquina stone. 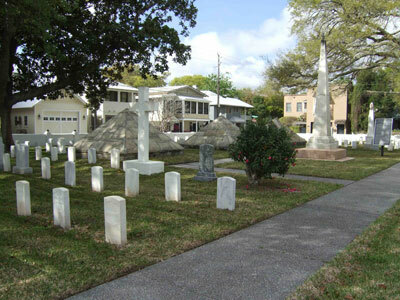 The cemetery features two prominent monuments; the Dade Pyramids, which consists of three eight-foot-tall coquina stone pyramids, and the Dade Monument, a 20-foot tall white marble obelisk. The pyramids are dedicated to all casualties of the Florida Wars, including those who died during its most infamous episode, the Dade Massacre. In December 1835, Major Francis Dade, 100 soldiers, seven officers, and two civilians received orders to travel from Fort Brooke, near present-day Tampa, to Fort King, now Ocala. Members of the Seminole tribe followed the soldiers over the first several days of their march before launching their attack at a narrow point along the trail. Dade died in the initial volley, and those who survived the ambush were pinned down with no chance to launch a counterattack. Only three soldiers survived the massacre, with one dying the following day and two shortly thereafter. At the war’s conclusion in 1842, the remains of Dade, his men, and more than 1,300 other soldiers who died during the war, were reinterred in three large funerary vaults at what was then the St. Francis Barracks Cemetery and topped with a coquina stone pyramid. At the time, the pyramids were covered with white stucco. In 1881, a modest white marble obelisk was erected to commemorate Major Dade and the men who died with him at the 1835 massacre. The soldiers and officers of the barracks provided funding for the memorial by having each man donate one day’s pay. 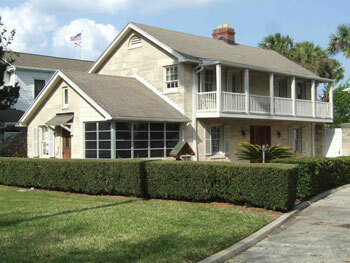 St. Augustine National Cemetery is located at 104 Marine St. in St. Augustine, FL. The cemetery is open for visitation daily from 8:00am to 5:00pm; on Memorial Day the cemetery is open for visitation from 8:00am to 7:00pm. No cemetery staff is present onsite. The administrative office is located at Florida National Cemetery, and is open Monday-Friday from 8:00am to 4:30pm (closed Federal holidays except Memorial Day and Veterans Day). For more information, please contact the cemetery office at 904-766-5222, or see the Department of Veterans Affairs website. While visiting, please be mindful that our national cemeteries are hallowed ground. Be respectful to all of our nation’s fallen soldiers and their families. Additional cemetery policies may be posted on site. St. Augustine National Cemetery was photographed to the standards established by the National Park Service’s Historic American Landscapes Survey.